Sacramento, CA - There's a reason why they hold the best record in the NBA. The Memphis Grizzlies gave it their all when they faced a team without their best starter. DeMarcus Cousins was out with a virus for the second game straight game and the Grizzlies took advantage, extending their winning streak to five by beating the Kings 97-85. "It was important for us to come out strong. We did," said Memphis head coach Dave Joerger. "It was just a good game for us mentally to push through and finish in the second half." The Grizzlies dominated early in the first quarter hitting jump shots all over the perimeter. Good rebounding on both ends of the floor forced Sacramento to miss easy baskets and rush without following their shots. The Kings eventually found their rhythm, trimming the lead to two points by scoring off fastbreaks and playing defense. "We dug ourselves a deep hole early in the game and it was one of those things we couldn't get out of especially later," Rudy Gay said. "We tried, we made a good run at it, but it was just one of those things if we didn't have the hole go so deep in the first half we probably would've been in a better position." By the second quarter Vince Carter came off the bench with two 3-point shots to push the Grizzlies lead to 21 points. Zach Randolph recorded his 11th double-double scoring 22 points and grabbing 12 rebounds. A more slimmed down Marc Gasol added 18 points and six rebounds. Memphis made it look easy with good ball movement and shot selection. "We've been playing together a long time and it's finally coming together," said Randolph. "The whole team is improving as one unit, I think it's our year. Our bench has been playing great and everybody is on the same page." "I think everybody came into training camp with that mindset of coming in and being aggressive from the get-go and being the team that we want to be," Gasol said. The Grizzlies improved to an NBA's best 15-2 record overall and 7-2 on the road. 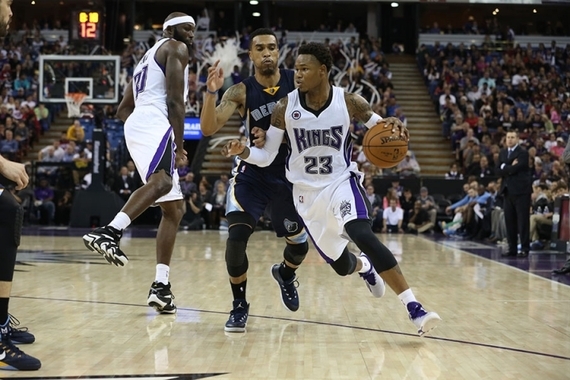 Memphis has won their last nine games against the Kings, including the last five meetings in Sacramento. The Grizzlies forced the Kings into 23 turnovers, matching a season-high 23 they recorded on October 29th against Minnesota. "Well, when you look at the box score, obviously letting them shoot 48% in the field goals was too high," said Kings head coach Michael Malone. "We shot 47% and outscored them in the paint but we had 23 turnovers for 23 points." Sacramento cut the lead down to three points midway through the fourth making it a 79-76 game but Memphis went on a 19-6 run. Without Cousins to block in the paint, the Grizzlies had there way with the Kings. The tandem of both Gay and Cousins on the floor proves to be a better match-up and their opponents know this. "What's wrong with DeMarcus? Why he ain't playing?" asked Randolph pre-game. "This ain't the game he need to be missing." Ryan Hollins who started in place for Cousins for the second straight game was ejected after receiving his second technical foul. Gay finished with 20 points leading all scores for Sacramento. Reggie Evans recorded his first double-double of the season with season high of 17 points and a game high 20 rebounds. "I felt good, I was shocked to hear my name called but you got to be ready to go at any time," said Evans.